I woke up cold last night. Half awake, but mostly still asleep, I stumbled around my house in search of the winter blankets I happily stashed away many months ago. In the middle of this sleepy hide-and-seek, I smiled; I smiled because I realized that this was the first chill in the air I had felt in quite a while. We've had a stifling summer in Boston this year and this cool breeze was more than welcome-feeling cold and shivering slightly was definitely welcome. This colder air will eventually bring with it the fall. And though this is a brief preview of what's to come, I woke this morning reminded of my favorite season; full of anticipation. The fall, autumn, automne, otono.... I always welcome the fall. Autumn is synonymous with harvest and perhaps that's why I enjoy this season so. I have never been a farmer or involved with a harvest and therefore it's easy to romanticize all that comes along with a harvest.  .  All of the previous month's hard work comes to fruition; crops are bountiful and it's a time filled with gratification . And perhaps, just perhaps, the accomplishments that are so often associated with the fall are what makes the season so lovely. It is a time to celebrate, to shake off the old and prepare for what's to come (in New England, I now know that a wicked winter is headed our way). For me, it is the fall, more than any other season that always welcomes change. The cool breezes and chilly air wake me up out of my warm, summer daze. So what did I do this morning? 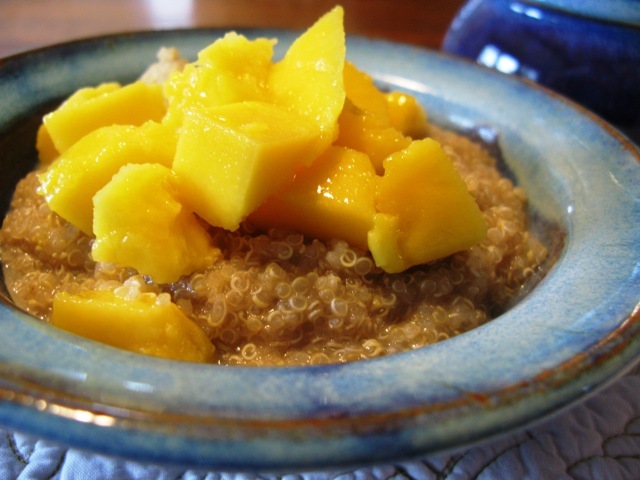 I celebrated the the first glimpse of fall with a delicious bowl of Banana and Mango Quinoa. Hey, it is still technically summer so I threw some mango into the mix! This dish is delicious, healthy, and full of fiber. And it's no more difficult than making oatmeal. If you are ready to change things up in the morning, try this sweet quinoa recipe out and I'm sure you'll soon be adding it into to your weekly rotation. I make mine in huge batches and if it doesn't all get gobbled up in one day, I eat it for breakfast the next morning. Start by cooking your quinoa according to the directions on the package. When the quinoa is close to being fully cooked add a splash of soy milk (a few Tbsp should do) and season to taste with vanilla, cinnamon, and nutmeg. Make sure the heat is on low and add the fig paste. Stir until the fig paste has dissolved completely. Add the banana while the heat is still on and stir. Remove from heat and add your mango. Voila! It's that simple, I promise. In the food processor add unsweetened dried figs and water. Process until a thick paste forms. This natural sweetener will keep in your refrigerator for a few weeks as long as it is properly sealed. Use any time that you would use sweetener when cooking. If you don't like figs, try apricots or dates... whatever you like works here.